A pleasant change from the blood-and-guts staple of modern slasher films, The Woman in Black is a throwback to those good old-fashioned horror movies that relied on eeriness rather than gore to deliver the scares.I’m going with three out of five for The Woman in Black; it’s surprisingly good fun. Just make sure you stick your popcorn in the holder on your armrest – you don’t want to spill it all over yourself each time you jump in your seat. Abracadabra! Avada Kedavra! The boy wizard has grown up. How else do you explain Daniel Radcliffe — as a widower and busy-yet-caring father — for pulling it off pretty well when there are hardly any dialogues to deliver… when everything depends on his expression (fear to be precise)… and when the real hero of the movie is none other than the woman in black. But then, who is this woman in black? Now what is it that keeps you glued to your seats till the very end? Daniel Radcliffe’s Kipps torn between the spiritual (he lost his wife during childbirth and now has visions of her in her wedding dress, aka his woman in white) and the supernatural.Not really into blood and gore? Not even into theories of the anti-Christ and the Book of Revelation? And yet want your dose of heebie jeebies? Beware The Woman in Black. Director Watkins, filming a novel that also spawned a 1989 movie by the same name, keeps the horror basic, natural and un-bloody.The Woman in Black gets greedy, not just in its relentless focus on the children as victims, but also in the number of times Arthur goes down a corridor holding out an axe for protection, returns and goes back again. Plus a film that understands the power of tricks played by the mind also deserved a better denouement. 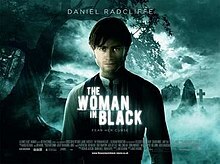 Blood and gore take a backseat in the modestly mounted and well acted The Woman in Black based on a classic novel Susan Hill first published in 1983. The mystery is satisfactorily solved but not before the audiences, even those who have read the book, have gone through several jolts. But one wishes Watkins had not tried to fill the film with too many conventional horror devices found in the standard Hammer films made over three decades unto the late 1970s. There are too many shots of rocking chairs and you cannot miss the black crow. You wish you could have seen little more of Hinds and McTeer.Still, on the whole, this is a satisfying mystery. What’s Good: The initial few reels where the viewer enjoys the suspense and intrigue; Daniel Radcliffe’s restrained performance. What’s Bad: The ordinary script which falls flat on its face in the climax; the absence of many chilling moments in the horror drama.Verdict: The Woman In Black is old wine in an old bottle. It will fail to do much at the Indian box-office.Loo break: A couple.Watch or Not? : Watch it if you are a fan of old-fashioned horror films. What you thus have is a run-of-the mill film which gets its scene and sound correct, but messes up everything else.Thus the main problem of the film is that it has problems too many. It’s more like an ensemble of scenes that are meant to scare you and which come one after the other, at one point close to 15 minutes pass without a word being uttered on screen. The story is like the ghost in the film, somewhere there but not visible and which irritates more than it excites.Thus in the annals of scary cinema if you were to ask, ‘horror horror in the hall (of fame), who’s the scariest of them all,’ be assured that even ‘The Men In Black’ will score over this lone woman.